BioSKIN&COAT is a natural, bioflavonoid based antihistamine that targets histamine receptors—where the central allergy response takes place. BioSKIN&COAT is developed to promote skin and coat health by supporting normal immune system and histamine response to allergens. Added to an organic, whole food, prebiotic, lignan-rich seed-fiberblend to optimize palatability and nutrient bioavailability, GMO-Free BioSKIN&COAT was designed specifically for the canine and feline metabolism and gastrointestinal tract, with biologically active ingredients that have not been exposed to oxidation. Does not contain any artificial: flavors, colors or binders. What Coat Conditions Can Benefit From BioSKIN&COAT? BioSKIN&COAT supports skin health and normal histamine activity. It is a natural bioflavonoid based antihistamine that limits the impact of allergen triggers by supporting normal histamine production and healthy immune response. It is recommended for dogs and cats showing signs of allergies, hotspots, or yeast overgrowth. Most skin & coat formulas are simply fatty acid products, usually fish oil supplements. Allergies, dry skin, hotspots, poor limp faded coats, brown discoloring between the dogs toes, smelly ears and coats will require an antihistamine first to bring the inflammation down and allow the skin to heal. BioSKIN&COAT does this using a natural Japanese flower extract called quercetin. Quercetin regulates histamine production and promotes healthy immune response to allergens. Along with quercetin, BiologicVET includes MSM an anti-inflammatory with analgesic properties and helps flush toxins and allergens from cells. We add antioxidants like grapeseed extract and ginkgo biloba that support oxidative damage of free radicals and regulate inflammatory reaction. The specific amino acid l-cystine supports insulin health and digestive enzymes from pancrelipase ( standardized to contain lipase, amylase, protease) and papain and more protease improves digestibility of nourishment. Plus vitamin and minerals Vitamin C, Zinc and Biotin are added for skin and coat maintenance and health. All of this is blended into a certified organic delivery system of defatted flax, sunflower and sesame seed providing the good bacteria in the intestinal tract of the dog a great prebiotic food source to improve the dog’s immune system. This fiber also supplies plant estrogens called lignans that the good bacteria convert into mammalian estrogens balancing hormone function in the dog especially when a dog has been spayed or neutered. Each scoop (1 tbsp) will provide at least 20mg of lignans, enough for the recommended amount of 1 mg of lignan per lb of dog weight. By improving the intestinal tract function, immune system, and hormonal function of the dog there is better absorption of the nutrients from the formula and the food the dog is eating allowing the BioSKIN&COAT formula to begin to work in a very short time. Often within a week. BioFATS supplies your dog or cat with active essential fatty acids known to optimize, nourish and protect. This precise ratio of omega 3-6-9 fatty acids supports healthy metabolic and hormonal activity as well as normal inflammatory and histamine response. Adding BioFATS to your pet’s meals assures they receive the exact proportion of fatty acids their bodies need to sustain and maintain healthy skin, coat, maintain normal shedding, joints and overall general health. GMO-Free BioFATS is a fresh and antioxidant protected supply of wild salmon oil, organic flaxseed and virgin olive oils, supplying nutrients known to support health. How Will BioFATS Help With My Dogs Coat? Once the BioSKIN&COAT has begun to do it’s job a quality balanced fatty acid supplement should be added to the dog’s diet. This is the key to bringing all aspects of health under control. The addition of BioFATS provides your pet with the precise ratio of Omega 3-6-9 fatty acids needed to support healthy skin, coat, joints, overall health and wellness. Animals require two essential fatty acids (termed “parents”): alpha-linolenic acid (ALA; an Omega-3) and linoleic acid (LA; an Omega-6). The actions of these two parent fatty acids mirror each other in making non-essential fatty acids (termed “derivatives”). Omega-3 derivatives (EPA & DHA) work in tandem with Omega-6 derivatives (GLA). This activity is required by your pet’s body for healthy inflammatory and histamine response, metabolism and overall health and wellness. If a sufficient quantity of the two parent essential fatty acids are not supplied in a proper ratio, the production of Omega-3 derivatives and their Omega-6 ounterparts happen out of sync, leading to chronic inflammation, allergies, arthritis and other serious health conditions. BioFATS is a combination of wild salmon oil (providing EPA and DHA), organic flax oil, virgin olive oil, digestive enzymes (pancrelipase), phosphatidylcholine, natural vitamin E d-alpha tocopheryl plus mixed tocopherols and vitamin C naturally preserved with a Sage oleoresin. BioSKIN&COAT in combination with BioFATS provides a synergistic support to your pet’s immune system in the regulation of inflammatory and allergen response. We know the importance of being able to trust the products you give to your loyal companions. Our integrity and devotion to pet wellness drives everything we do. BiologicVET is committed to producing safe and effective products and has voluntarily worked to meet several quality standards to bring you peace of mind. Good Manufacturing Practices (GMP) Certified— We manufacture our own products so that we have complete control over every ingredient that goes into BiologicVET products. Our Canadian manufacturing facility located in Maple Ridge, British Columbia is certified by Health Canada in accordance with Good Manufacturing Practices (GMP). Using the same care and diligence used to make products fit for human consumption, we test every raw material for purity before allowing it in our products. 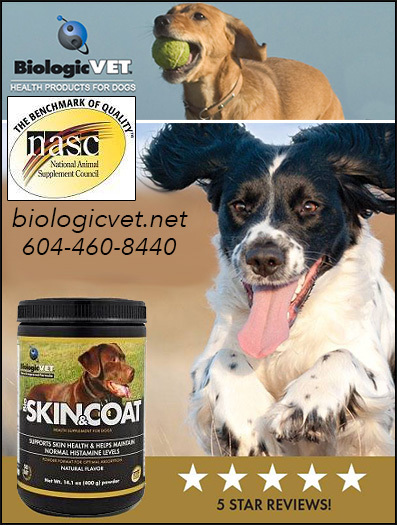 National Animal Supplement Council (NASC)— BiologicVET products carry the National Animal Supplement Council’s seal of approval. This recognition is given to companies that pass an audit process and manufacturing quality protocols. This independent organization evaluates the ingredient, label and health claims so you can make informed decisions about your pet’s health. Low Risk Veterinary Health Products (LRVHP)— BiologicVET has met conditions established by Health Canada and has been issued unique product-specific LRVHP notification numbers. LRVHP ensures that only approved and safe ingredients are used in the products. The manufacturing practices and quality control systems used to manufacture, package, label, distribute and store this product must comply with the Good Manufacturing Practices requirements. The requirements are similar to those applicable to Natural Health Products used in humans. What Do Customers Say About BioSKIN&COAT? This is an excellent product, I have two labs and it is about 8 weeks or more that I gave them this everyday once a day and let me tell you they both have amazing coats, I have chocolate labs and you can really see it. The fact that my female had itchy skin, I was hoping that this would help and it did!! Impressed at how well it works! It really works!Very cost effective compared to vet supplements, easy to add to food, has reduced need for allergy medications! I purchased this initially back in August 2013 for our 7 year old Black Lab who has had chronic skin issues. Specifically, allergies and yeast infections. For the past two years we have been battling on-going issues with yeast in her arm folds, on her stomach, ears, chin, etc. Prescription anti-fungals worked temporarily but the issue would return within weeks of ceasing medications. This product did not work overnight, and it did indeed take an entire bottle to notice the difference - but what a difference. She went from a sparse hair coat to a full, thick coat. Notably, the texture of the hair is much softer, smoother and her undercoat is incredibly thick. The on-going yeast issues have resolved (about mid-way on the second bottle) and the musky, yeasty smell of her skin has completely disappeared. The color of her coat has even seemed to change, from a dull black that looked even dusty, to a purplish-blue shade of pure black. She is much more comfortable and the non-stop itching has reduce by approximately 80 - 90%. I've had people and friends even ask if we had gotten a new dog because they didn't recognize her. Most importantly, I'd say her quality of life has greatly improved as her skin is healthier and requires less allergy medications. I would HIGHLY recommend this product, but encourage you to try the entire bottle (or two) before you make a decision as the results weren't overnight (nor could you expect them to be given that they involve skin and coat). Thank God for this product!! Our 5 year old Chocolate Lab has been plagued with seasonal allergies since the age of 1. Each year it gets worse and worse. We had tried many expensive meds, shampoos, topical treatments, etc. and nothing alleviated the symptoms. Last year he was maxed out with 125 mgs of Benadryl 3 times per day (that’s 375 mgs/day total!) and was getting bloody diarrhea from it. It barely helped and his full-time job became scratching, biting, and licking. His legs and paws were bald and very sore: poor quality of life for him. Thankfully it was only seasonal and he got a break from it once the snow fell. My husband found this product online and we gave it a try. Within 2 weeks our dog was practically symptom free! I see him scratching and chewing every now and then but nothing to the extent that he had every past spring/summer/fall. I really didn’t expect such immediate or great results. I introduced the total recommended dose over a period of a week and he had no side effects from it. I mix it with a little canned food once a day. I will continue to use this product for our dog. The results were amazing. Cost wise, it’s actually cheaper in the long run than most everything else we tried. I would recommend it for any dog suffering allergies. It’s definitely worth a try. Easy to mix into food, price - very reasonable compared to vet meds, taste and smell - very natural not like most meds, side effects - none noticed in two years-At age 5 my American Eskimo developed "seasonal allergies". From Sept to Dec she would rip out all of her fur on her hips, then continue to chew until she was bleeding; she hid behind a couch (she is normally my shadow), and drank and ate minimally. The vet's medications made her vomit and gave her awful diarrhea. In the third year, the vet had new medication that eventually worked but was difficult to administer and very expensive. I started giving her BiologicVET BioSKIN&COAT daily throughout the year mixed into a bit of wet dog food. For the past two allergy seasons, she has remained a happy dog with all of her fur intact. What an amazing difference! We are both so thankful to have found BiologicVET BioSKIN&COAT. And the cost is about a third of the cost of the veterinary medication...not that I care, because my dog no longer suffers so badly for three months of each year. If your dog suffers from "hot spots", you must try this product. Call Us Today To Order BioSKIN&COAT! We want to hear about your dog! Make sure your dog has a healthy coat and body with BioSKIN&COAT! We welcome your calls and look forward to talking to you today!